The side of a sheet of PARCHMENT or vellum that originally faced the animal's flesh. This is generally whiter and softer than the HAIR SIDE. 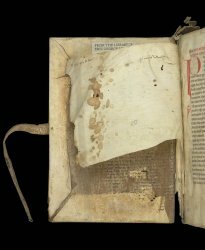 The two sides are often readily distinguishable, save in INSULAR manuscripts, where skins were not scraped down as far, so that both sides retain a suede-like surface and sometimes a stiff, cellulose character. Flyleaves at the beginning or end of a book serve to protect the text in the event of worming or damage to the BINDING. They often carry PEN TRIALS and inscriptions concerning PROVENANCE. Flyleaves were sometimes used for trying out designs (see MODEL BOOK). See also ENDPAPERS and PASTEDOWN. A sheet of writing material, from the Latin for a leaf, one half of a BIFOLIUM. 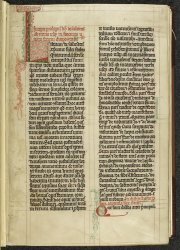 The front and back of a folio are referred to as the RECTO and VERSO, respectively. 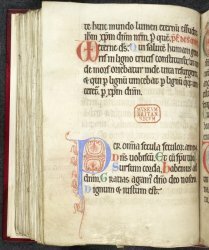 The numbering of leaves, as opposed to pages, is termed foliation and is commonly found in manuscripts. 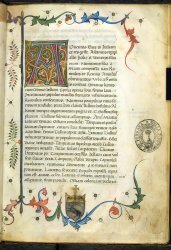 'Folio' and 'folios' (or 'folia') are often abbreviated as f. and ff., or fol. and fols., The term can also be used to denote a large volume size, in which each sheet is folded only once, and in this context can be abbreviated to fo or 2o; cf. QUARTO, OCTAVO, etc. The edge of a book, opposite the SPINE. The fore edge is sometimes GAUFFERED or carries painted decoration or images (fore-edge painting) or labelling for shelving purposes. 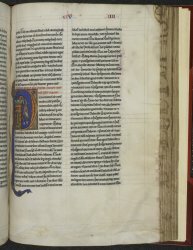 RULING that provides a frame to contain the text block. See also MISE-EN-PAGE. Ornament featuring a repeated, openwork rectilinear geometric pattern. 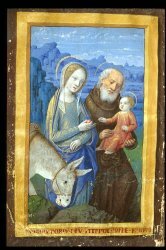 A fully painted ILLUMINATION is one that has been rendered throughout in PIGMENTS rather than wholly or partly in tint or line alone (see OUTLINE DRAWING and TINTED DRAWING).